Is John McCain trying to lose? On the Straight Talk Express, that scene in the New Hampshire hotel room has become renowned. (“Everyone keeps asking me why I wasn’t more excited,” McCain said when I inquired about it.) But another group of reporters says something even weirder happened two weeks later. According to them, the most bizarre McCain moment occurred not at the height of his campaign but at its nadir, when the senator was being routed in South Carolina. As the returns filtered in—showing McCain trailing by eleven points—his aides headed for the bar, where they drank and smoked cigarettes, too depressed to spin more than sporadically. Cindy McCain began to cry once again, only this time in despair. “How could they believe all that about you?” she asked, as exit polls showed how effective George W. Bush’s attacks had been. In fact, the moments the journalists found so strange were not strange at all; they were a glimpse of the true John McCain, the one often masked by his candor. And they reveal the central dilemma of his campaign, a dilemma less ideological or strategic than psychological. McCain wants to win, but he often seems more comfortable losing. Throughout his adult life, first in the military and then in politics, he has sought out hopeless causes, championed them brilliantly, and enhanced his stature through their defeat. And in this campaign the pattern has reasserted itself: At critical moments he has opted for glorious failure rather than dishonorable success. Now, as the campaign enters its final days, he may no longer be able to rescue his candidacy from his crusade. Such insubordination made McCain the bane of his superior officers; he racked up so many demerits he was nearly expelled. Yet in the process he captivated his classmates’ imagination—a kind of lone figure, collar turned up, cigarette dangling from his mouth, resisting the establishment. After graduation, McCain became an icon not just to his classmates but to his country. Shot down over Hanoi, he was imprisoned and tortured for nearly six years. Unlike Dwight D. Eisenhower or Ulysses S. Grant, he did not take a hill or sink a ship. Instead, he became a new kind of hero. He “had to learn to suffer,” says Wes Schierman, a fellow POW who recently showed up at a McCain rally in Washington state. “He couldn’t really win any battles, but he was a good resister, an honorable one.” He emerged from the ashes of the country’s greatest lost cause as one of its only symbols of pride. But he seemed at a loss as to how. For the next few days he appeared to vacillate between playing politics and retreating into a noble crouch. One day he authorized scathing phone messages to Michigan Catholics, attacking Bush’s visit to Bob Jones University; the next day he said he would never go negative. One day he vowed he was a die-hard conservative; the next he said he would embrace “libertarians and vegetarians.” “I’ve got to stay on the message,” he said. “I can’t just talk about push polls like I did in South Carolina.” But he couldn’t seem to fully stop himself. He talked about Pat Robertson’s scurrilous phone calls in Michigan and about how Bush was coordinating Robertson’s smear campaign. In a desperate fight for California—where Asian Americans represent an important voting bloc—he apologized for calling his Vietnamese captors “gooks,” but then a few days later, when another reporter asked him about the remarks, he said he did not view them as a misstep and had called his captors worse. It almost seemed that the more his campaign failed, the more his crusade succeeded. His events had the feel of spiritual revivals. In Washington state, he got off a ship in Bremerton, where 5,000 people had waited for hours in the cold and rain. As he came down the plank, a spotlight followed him and the Rocky theme music played. Teenage girls reached out and tried to touch him, shrieking. Men surged forward, beseeching him for his autograph. When we climbed on a bus afterward, they pushed their hands up against the windows. 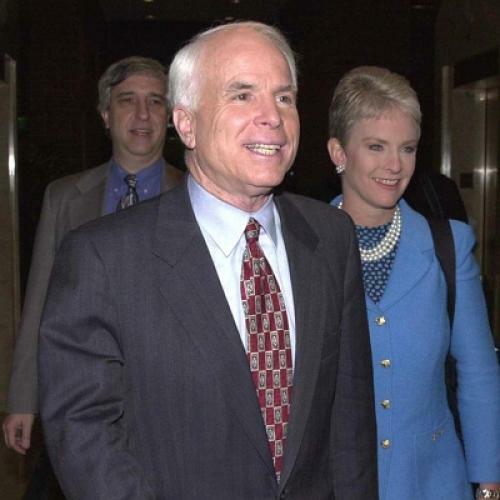 “It’s like traveling with Mick Jagger,” Cindy McCain said. At a rally in Sacramento a mother stood up and brought her child forward, saying she was horrified when she learned about Clinton’s scandals. She asked McCain to touch the boy, as if to make him pure. THE PROBLEM IS that presidential campaigns are not really about purity. They require, as Bush seemed to accept after New Hampshire, an ignobility—a tolerance, even a passion, for the unseemly fray. Crusaders who refuse to tarnish themselves end up, like Eugene McCarthy or Ralph Nader, with their dignity. But they watch from history’s sidelines. As McCain approached Super Tuesday, his aides seemed to recognize that his defeat would probably mean the defeat of their cause as well. “I think John McCain is our last chance to save the political system,” said Weaver. But by then McCain had become a creature of the crusade. In an act of political courage that effectively immolated his campaign, he began to call the leadership of the very movement he needed to court—the Christian right—“evil.” When I asked him on the Straight Talk Express one morning if there were any crusaders he admired from history or literature, he named Robert Jordan from For Whom the Bell Tolls. What happened to him? someone asked. McCain described how Jordan had gotten trapped on the hill that the fascists were about to overrun, how he lay down on the ground and cocked his rifle, telling the woman he loved that she would always be with him. Then he waited to die. There was a moment of silence as everyone contemplated the story. Then McCain smiled. “Hell of an ending,” he said. This article appeared in the March 13, 2000 issue of the magazine.